While it seems like cash will burn a hole in your pocket and lead to quicker spending, it actually has the opposite effect. Forking over cold hard cash is much different than simply sliding a card. It is tangible–and visual–so you you’re aware of exactly how much of your money you’re burning through. Set a spending budget for yourself for the week and pull out that amount of cash in the beginning of the week. As the week progresses you’ll see just how much money you’re left with, and that spending is likely to decrease as you see those bills in your wallet disappearing. It may seem like overspending is mindless, but there is psychology behind everything we do. In order to curb frivolous spending, it’s important to find what it is that triggers it in the first place. When do you tend to overspend? A certain time of day? Perhaps when bored and online on a break at work? 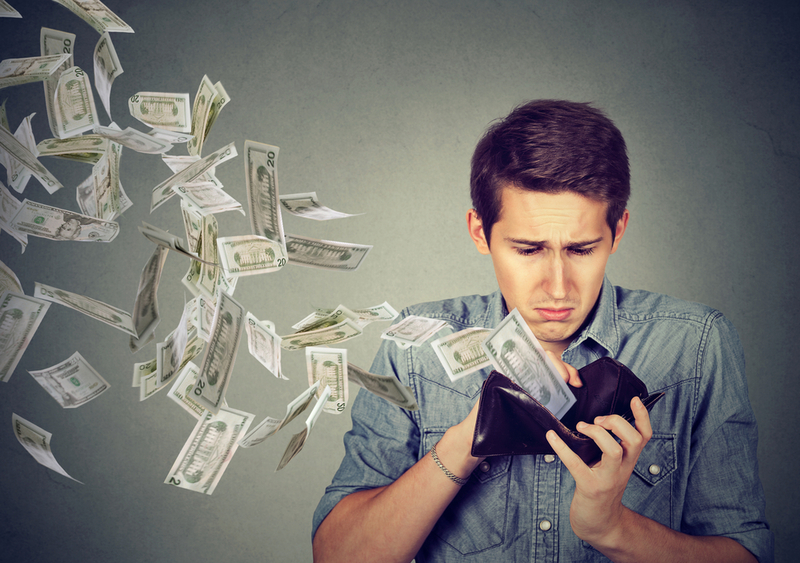 What mood are you in when you typically overspend? Once you establish what it is that leads to your unnecessary spending, you can begin to break the habits. Sometimes simply becoming aware of these triggers serves as a deterrent, while others may time some training to overcome. Peer pressure does not exclusively exist within high school parties. In fact, it is the social element of our lives that is often the biggest culprit of our overspending. Though the people in your life don’t intentionally set out to sabotage your budget, it’s likely that you spend more money when out with friends–especially if said friends are also not the best budgeters. While sometimes you’ll ultimately have to make the responsible decision to decline certain invitations, there are ways to avoid overspending social situations without inducing serious FOMO (fear of missing out). Suggest grabbing coffee instead of breakfast, or eating in with a bottle of wine instead of going out for dinner and drinks. And ultimately, let your friends know that you’re attempting to spend less money. By making them aware, they can suggest future plans that are perhaps less financially intensive, and maybe, they’ll join you in saving! Keeping a diligent eye on your finances and tracking your spending is so incredibly important. In fact, if you don’t remain cognisant of what is going in and out of your bank account at all times, you’ll never be in control of your spending–and you especially won’t ever get in front of it. While keeping and balancing a checkbook might seem antiquated to younger generations, sometimes old school is the way to go. Writing and deducting all of your spending by hand keeps you up close and personal with your finances, and as a result, you’ll be confronted with how you spend every single penny. As you become more used to budgeting, you can use tools such as budgeting apps to help you track your money. Just remember to stay consistent in your tracking. The worst thing you can do is simply check your online balance from time to time while mindlessly swiping your card! No, don’t actually blow your whole paycheck at the beginning of the month. Instead, have a set budget that you abide by, in which every dollar has a predetermined home. Rationing your money and allocating it to different categories (bills, groceries, gas, entertainment, etc.) ahead of time ensures less mindless spending. You’ll look at your account balance and see money that’s already has an assigned purpose instead of a sum of money waiting to be spent! Creating a budget is truly key! Check out our previous post, HOW TO CREATE A PERSONAL BUDGET: A GUIDE FOR BEGINNERS.